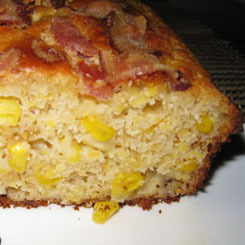 I reckon cornbread is about as South African as you can get but seldom see it anywhere. Just as an aside, when you next make pap for the braai, add a tin of sweetcorn about 20 minutes before you serve it, it’s really great. Heat your oven to 200 Celsius and grease your tin well with butter, don’t be shy with the butter. In a large bowl add the flour, mealie meal, salt and baking powder, make a well in the center. In another bowl add the buttermilk, oil and egg, give it a really good whisk and then pour into the well in the dry ingredients and mix well to combine everything. Now add the corn kernels and the cheese and use a folding motion to distribute the corn and cheese evenly. Pour the mixture into the greased tin, cover the top with the bits of bacon(if you are using bacon) and bake for 20 to 25 minutes or until the top is beautifully browned and the bacon sizzling. Let it cool for about 10 minutes in the tin (if you can) before you remove it or you can serve it straight from the tin. 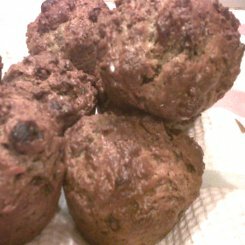 This recipe can be kept in the fridge for about a week and produces fantastic raisin bran muffins every time. 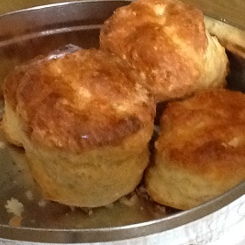 I made a batch of this on Sunday and have enough for about another 4 muffins for tomorrow morning. In total it makes around 30 muffins in a muffin tin that has 6cm diameter holes that are 3cm deep and 2 is more than enough for me for breakfast. 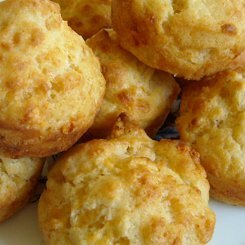 Believe me, your family will love these, pop them in the oven while making your morning tea and by the time the first people emerge they will be ready to come out of the oven. What could be better than freshly baked, healthy and delicious bran muffins every morning? Take a large bowl and add all of the dry ingredients together. Give them a mix and set aside. Now add all of the rest of the ingredients to another bowl, give it a good whisk and then add to the dry ingredients. Take a large serving spoon or heavy wooden spoon and mix them all together very well. It takes a bit of elbow grease because you have quite a lot of mixrure so enlist the help of the kids or anyone else who is going to benefit. Fill your muffin tray almost to the brim and pop them in a 190 Celsius oven for 15-20 minutes. Thats it, beautiful, hot home baked rasin bran muffins are ready for breakfast! You can add nuts or other dried fruits to make them according to your taste just keep the proportions the same. Believe me, you are going to want to try these! The recipe can be halved without any problem. 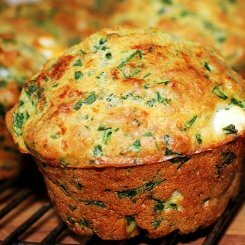 You might also want to try the Quick cheese muffin recipe for school lunch boxes or weekend treats. 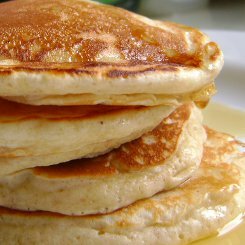 These buttermilk pancakes are beautifully light and puff up so nicely. I love to put a nice size piece of soft butter on top of a stack, smother them in maple syrup and have a few pieces of crisp streaky bacon on the side but serve them with strawberries warmed in a pot with a little sugar or anything else you feel like. You cam alos break up the crisped bacon into small pieces and add them to the batter for something different. This makes about 12, 10cm diameter pancakes. Some people call these flapjacks, I call them pancakes. If you want to serve these on a school morning, make the batter the night before and keep it in the fridge. Give the batter a stir in the morning and add a little more buttermilk if needed. Sift the flour, salt, bicard of soda and baking powder into a mixing bowl. Make a well in the center and break in the egg. Now with a whisk mix the egg and add half the buttermilk and melted butter. Whisk gently drawing the flour in from the sides. If you add too much liquid it will become lumpy. Now gradually add the rest of the buttermilk until you have a thick pouring cream consistency. The secret of these pancakes is to now leave the batter to stand for at least 30 minutes before you make your pancakes. If you are adding bacon bits to the recipe, do it now. Heat a thick based pan on a medium heat and add a little butter. The best way to do this is to brush the base of the pan with melted butter. Take a ladle and spoon in the batter to form 10cm pancakes, wait for bubble to appear on the surface (about 3 minutes) and then flip them over and watch them puff up. The cooked surface should be beautifull browned. Cook the other side for about another 2 minutes and make a stack of 3 or 4 per person. YUM,YUM,YUM winter breakfast at it’s best. Heat your oven to 200 Celsius and butter a muffin tin. Sift the flour, salt, baking powder and mustard powder together into a bowl and then add the cheese and give it a quick turn with a spoon. Whisk the egg lightly with a fork to break it up and add to the milk, then add it to the flour mixture and give it a good mix to distribute the cheese evenly and make a consistent batter. Spoon into the muffin tin and bake for 10 minutes. It really doesn’t get much simpler than that folks and they are very delicious. They will also keep in the fridge for a few days ready for work or school. Try the banana bread as well if you are in baking mode. This is a really easy banana bread recipe that is moist and will satisfy you day or night. 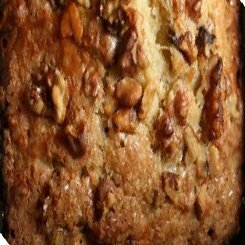 The pecan nuts add such a wonderful texture to the banana bread that you really don’t want to leave them out. This recipe is from an old recipe book that never fails to turn out perfectly so give it a try, you will be very glad you did. If you prefer a more traditional easy banana bread recipe try this easy banana bread. You really need a scale for this one, so if you havn’t got one go out and get one. Add the sugar and butter to a bowl and use a wooden spoon to cream them together until they are a shade paler and nice and creamy. Add the eggs and mix together, then sift over the flour, baking powder, bicarb and salt. Give it a few turn with your spoon and then add the mashed bananas and nuts. Mix the whole lot together well so that the nuts and banana are evenly distributed. Pour into your bread tin 21cmx8cmx9cm and sprinkle a few left over bits of pecan nut over the top. Bake in the middle of the oven for about 40 minutes or until the top is browned and a skewer comes out clean. Check it at 35 minutes for safety sake. Remove from the oven and allow to cool for about 5 minutes before turning out onto a wire rack to cool. It seldom lasts until it is cool and I can tell you that a warm slice of this with a generous buttering is too good to resist. 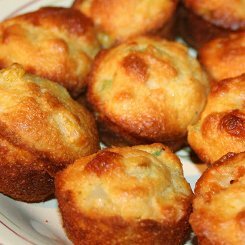 You can also make these in a muffin tin but the baking time is reduced to around 20 minutes or so, so check on them frequently if you decide to make muffins. 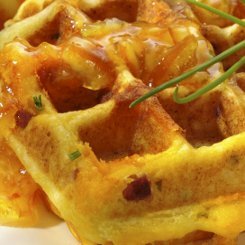 To make this a sweet waffle, just substitute the cheese and ham in the mixture with one heaped tablespoon of sugar and thats it, you have a light waffle recipe that you can now add other goodies to like chocolate chips, add 50g, or berries, add 50g, you get the idea. Beat the egg whites until stiff peaks stage and set aside. Beat the Yolks in another bowl, then add the melted butter and the milk. Beat them lightly to combine. Sift the cake flour and baking powder into a bowl and then toss in the salt, cheese and ham and make a well in the center. Add the egg yolks mixture and using a fork mix the ingredients together working from the center out. Don’t spend a lot of time mixing, just get it combined so there is no dry flour about. Now add the egg whites and fold them in until they are evenly distributed. The batter may be a a bit streaky but this is how it should be. Thats that, you are ready to make your waffles. 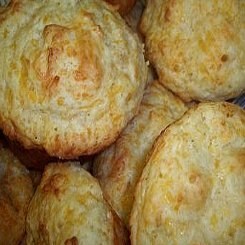 I am a big fan of marmalade for a savory and sweet combination but you may want to make a cheese sauce that you add a handful of chopped ham to as well, it’s simply fantastic. Other savory variations could be cheese and spring onions, bacon and almost anything… just get together your favorite flavours and set to it. You can also quite happily add a poached egg on top and then smother in cheese sauce and bacon. Hell I am getting seriously hungry typing this!